Non-destructive testing of components is an important auxiliary process step, not only in post-production but also in regular maintenance. The detection of cracks is currently done by using magnetic particle inspection, which is a decades-old, inefficient and ecologically undesirable process. There is an urgent need in industry to replace this technology with more up-to-date methods that provide fully automatic testing. Click the images above for a short introduction (left) and the full video (middle) and a summary of the demonstration for carbon fibre parts inspection (right). a full, parametric model of the thermographic imaging process for the automatic detection of cracks in parts of complex geometry, varying surface structures and for different materials. 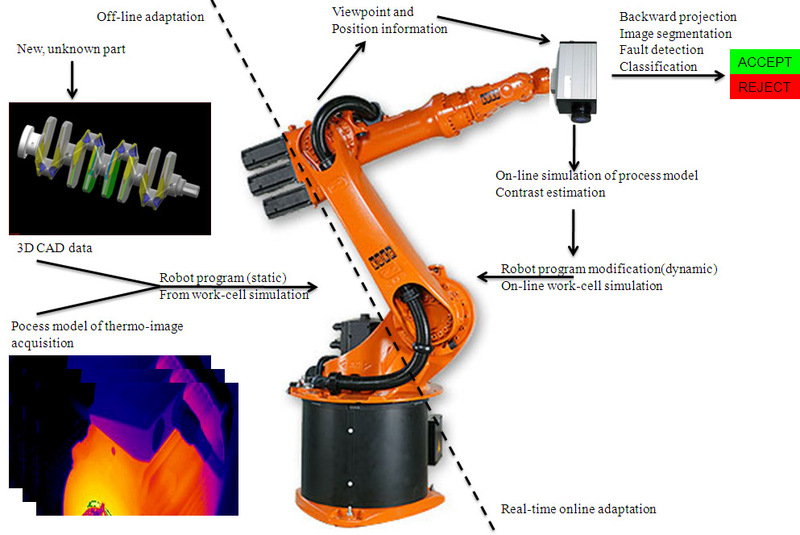 an automatic path and motion planning module that uses the thermographic process model to automatically generate a path for the inspection robot from 3D CAD data. a thermo-image analysis methods that not only aim at detecting cracks and making an accept/reject decision for the whole part, but also have the capability of self-evaluating the performance of the crack detection. Applications include inspection of metallic and composite parts in the automotive and aircraft industry as well as inspection during regular maintenance, mainly in the aircraft industry, where magnetic particle inspection is often a requirement. Market estimates show a potential of more than 1000 such inspection systems within 5-7 years after the end of the project. Despite a higher initial investment (compared to magnetic particle inspection) the robotic inspection system will save more than 400kEUR after 5 years of operation, thus contributing to a substantial increase in efficiency in these tasks. Furthermore, ecologically undesirable suspensions of magnetic particles that include corrosion-inhibitors can be avoided. The consortium consists of technology providers in robotics, industrial inspection and thermographic cameras and end-users that cover metallic and composite parts in the automotive and aircraft industry. SMEs play a leading role in the project and contribute 60% of the total effort. The project is funded by the European Commission in FP7 FoF under Grant No. 284607.